When Zech was a toddler, he suffered abuse at the hands of a close relative. Soon after, he began acting out by throwing things and hitting his mother. By the time he was in elementary school, his behavior had gotten out of control. Nine-year-old Zech sat in the principal’s office at his Council Bluffs elementary school and stared out the window as he waited for his mom Chrystal to arrive. It was the third time in one week he had gotten in trouble for damaging school property by jumping on desks in his classroom. He knew his mom would be upset, but he didn’t know how to change his behavior – he just felt so angry all the time. Earlier that year, doctors diagnosed Zech with Attention Deficit Hyperactivity Disorder (ADHD), Autism, and Childhood Bipolar Disorder. In an effort to help him, Zech’s doctor put him on medication, but that only made things worse for Zech because it gave him severe hallucinations. When Chrystal arrived, Zech’s principal brought both of them into her office to discuss his well-being. His principal knew he needed more guidance and help than her school could provide. She suggested they work together to find an educational setting that would better meet Zech’s needs. Their efforts led Zech to the Heartland Family Service Therapeutic School. At first, Chrystal was hesitant about sending him there, but when she learned how much they could help Zech grow, she took a leap of faith and enrolled him one week later. Chrystal felt relieved because she believed her decision created the positive, life-altering shift Zech needed. The Therapeutic School provides academic and therapeutic programming for K-12 students with major mental health diagnoses. 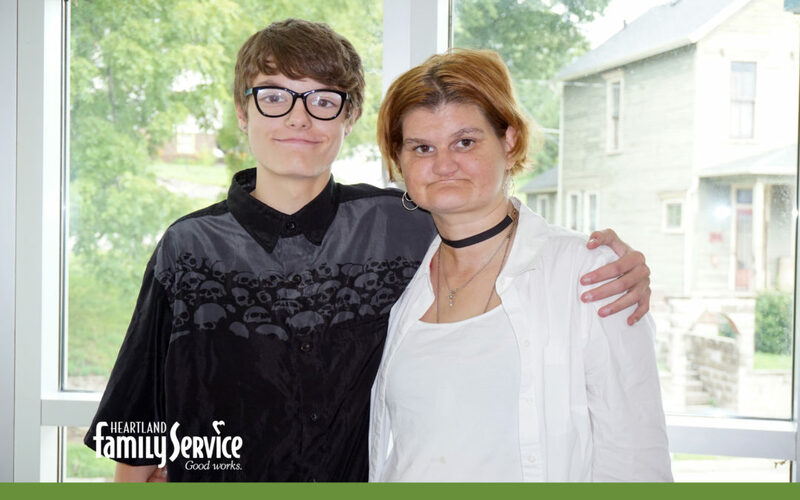 While attending the Therapeutic School daily for the next six years, Zech immersed himself in the comprehensive, far-reaching services that Heartland Family Service provides to all of its clients. Those services helped him and his family begin their healing journey. During his time there, he connected with his teacher Mr. McCabe, who helped him with his classes. His therapist Ms. Feind taught him coping skills to manage his emotions. With their assistance, and with the help of his family, Zech was finally able to begin healing from his childhood trauma. He started to establish healthy behaviors. Now, when Zech is upset, he channels his feelings into drawing or listens to music, rather than lashing out. Zech is excited to attend public school regularly this fall for the first time in seven years. He will start his sophomore year at Abraham Lincoln High School in Council Bluffs. He looks forward to going to college and to continuing to grow into a positive, helpful young man.